Update 2018, We decided for the new year to try and do all the 'healthy' things and change all the bad habits we could think of for 3 months. After all 3 months is not forever and just maybe some of these new habits might stick. I just turned 66 and before getting this filter machine, I had almost lost the use of my left arm, it hurt so bad and now I not only don't hurt anymore, Donna has gone from 22 meds a day down to 2 (can you imagine the savings? ), her colesteral is down 100 points, blood pressure down, weight off and energy up. # 1126563 and we will be your personal representative to answer all your questions and help you on your journey to a more healthy pain free life. 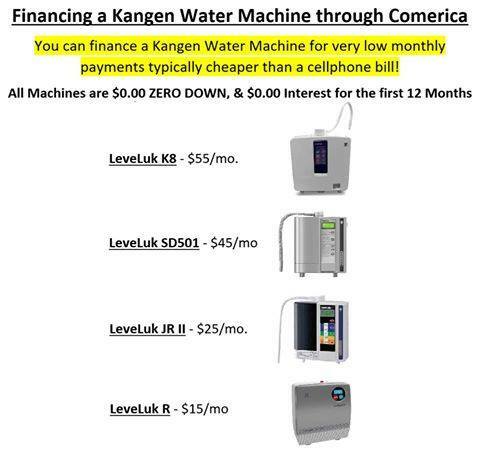 We are a Factory approved Kangen Alkaline Antioxidant WaterTM Machine Distributor. Learn all about the machines Here. SUPER HYDRATION, you can even drink it while running, no slosh, it gets absorbed. + extra electrolytes. www.enagic.com OUR COMPANY SITE, (water uses and machines)Use distributor number, to order anything. For people with 'Reverse Osmosis systems, you really need to add remineralization, between the RO and the pressure tank.